Sir Winston Leonard Spencer Churchill (1874-1965), Prime Minister. Sitter in 216 portraits. 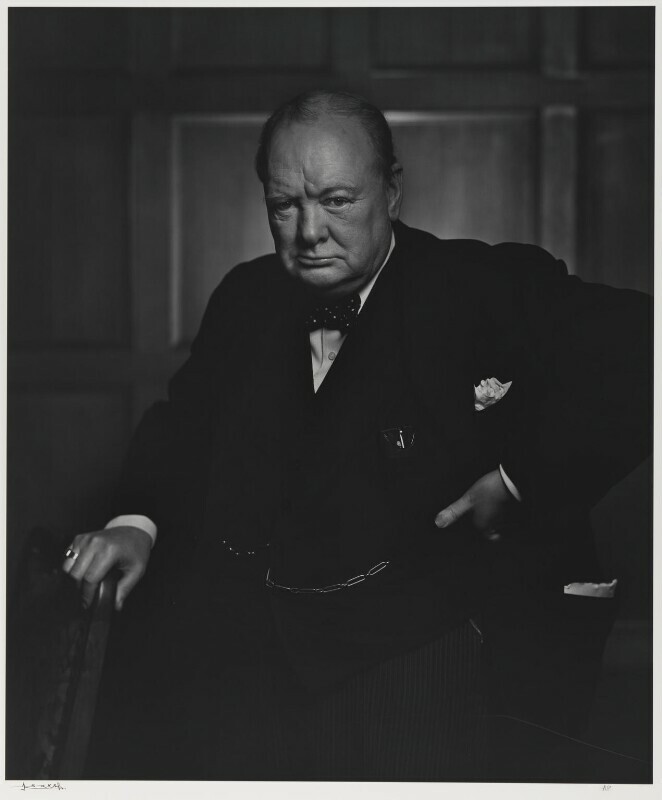 Karsh photographed Churchill on a visit to the Canadian House of Commons in 1941, when Britain was fighting for survival. Karsh boldly snatched away Churchill's cigar. 'By the time I got back to my camera,' he later recalled, 'he looked so belligerent he could have devoured me.' Known as the 'roaring lion', this image became a symbol of British defiance and is one of the best-known photographs of Churchill. The Blitz continues with sustained Luftwaffe attacks on British cities. As the bombing went on the urban population got used to the black out, the air raid sirens and nights spent in shelter. The idea emerged (to some extent a myth) of the 'spirit of the Blitz' where people pulled together united, disregarding traditional class and social divisions. Frank Whittle demonstrates the first test-flight of a plane powered by jet propulsion. Although the German, Hans von Ohain, built the first jet plane, Whittle was the first to patent a design for the jet engine (in 1930), and his subsequent work helped to advance the technology and made Britain leaders in the field. The Soviet Union and America join the Allies. The Soviet Union was forced to switch sides after Hitler attacked in June 1941, reneging the Soviet-Nazi pact. Six months later the US Navy was attacked by Japan at Pearl Harbour. The following day the USA declared war on Japan, and three days later Germany and Italy declared war on America.